Mariful Islam plants and harvests rice in his rural village in Bangladesh. But when it's not harvest season, he says, "there's no work for me to do." The loan was tiny. Just $19 to buy a bus ticket. But for Mariful Islam, the difference it made was immense. Islam is 24. 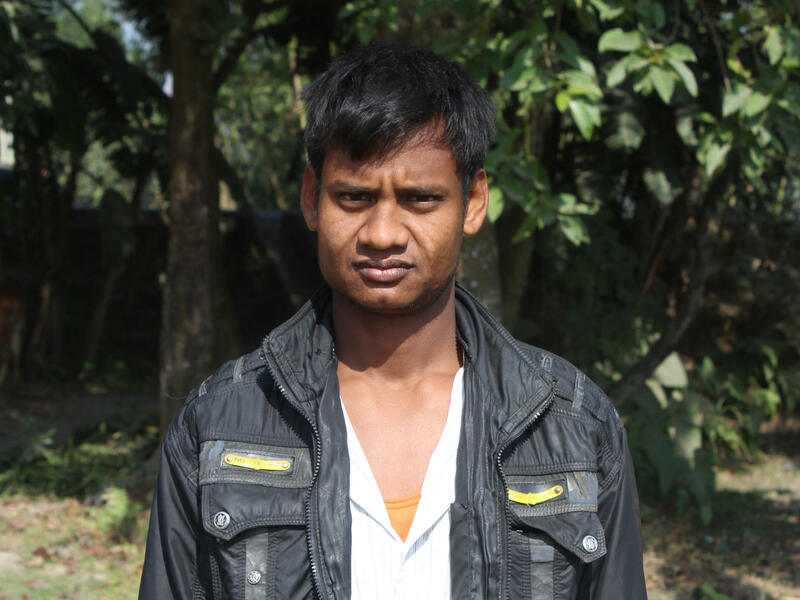 He has lived in the same rural village in Bangladesh his whole life. He doesn't own his own land. So he scrapes out a living working on other people's farms. "Mostly I plant and I harvest rice in the paddies," he says. But every September marks the start of a two-to-three-month period when the rice is just growing. "There's no work for me to do," says Islam. Which means he and his wife and their toddler son have to get by on the family's meager savings. "We have a lot problems getting enough food," says Islam. Instead of three meals a day, they cut back to two — skipping lunch. And they mostly eat rice. There is practically no meat or fish. Not even for his son. 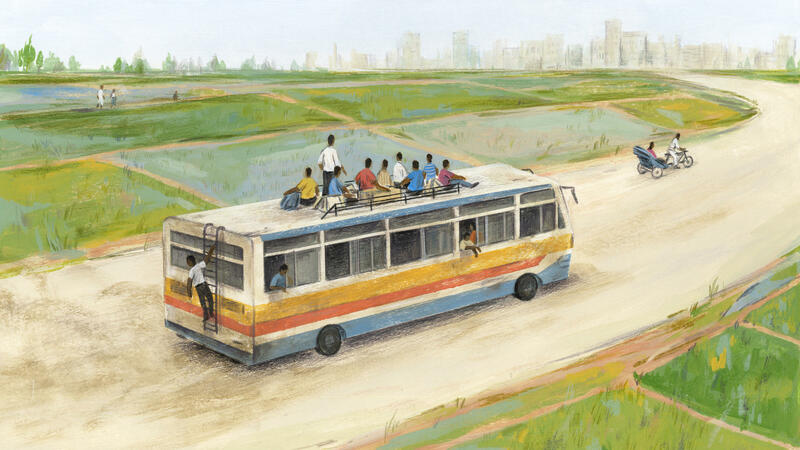 At times, Islam had considered heading to the capital city of Dhaka, about a seven-hour bus ride away. Maybe he could find a job there to tide the family over. But he always concluded it was too risky. He didn't have the money for the bus ticket. So he would need to borrow it from a local moneylender, who would charge an exorbitant interest rate of about 10 percent to 15 percent a month. And Islam couldn't be sure he would even get a job. After all, he had never been to the capital. Not once. What if it didn't work out? The family would be ruined. Mobarak is an economist at Yale University. But he grew up in Bangladesh, where he had heard a lot about the seasonal famine that plagues farmworkers like Islam. In fact, this period is so widespread — and so problematic — across Bangladesh it has a name. "It's called monga," says Mobarak. And he recalls that every year, the newspapers would be filled with reports about the latest multimillion-dollar aid program to get people through the monga season — sometimes straight-up food distribution efforts but more often food-for-work programs aimed at creating employment. Once he became an economist, Mobarak thought back to what struck him as a major flaw in this approach: In a place like rural Bangladesh, there is a limit to how many jobs you can create. Yet there is no shortage of jobs in Bangladesh's cities. And that gave Mobarak an idea: "Instead of trying to force job creation where the people are, why don't we try to move people to where the jobs are?" Specifically, Mobarak wanted to see whether a little bit of aid could give people in rural areas enough of a cushion so they could try their luck in the city without risking catastrophic consequences if they didn't find a job. Beginning in 2008, Mobarak and various collaborators set up a series of experiments. During the monga season, they give farmworkers a one-time, very low-interest loan — it's now about $19 — that they can use to get to the city. "We chose that amount because it pays for the round-trip bus fare — plus a few days of food," says Mobarak. The result: The villagers who've been offered the help have been about 60 percent more likely to try their luck in a city. In virtually all cases, it has been the men in a family who've made the journey. And once there, the vast majority of them have succeeded in getting a temporary job — mainly pulling rickshaws. Most significantly, with the extra money, their families have consumed an average of at least 36 percent more food. That is a much better track record than the traditional food-for-work or food distribution programs. "About five times as cost-effective," notes Mobarak. Mobarak has also found that the loan is particularly enticing when offered to the bulk of residents in a given village — as opposed to just a few individuals. Mariful Islam, the farmhand, is a case in point. This fall, both he and a neighbor were targeted in the experiment. "My neighbor said, 'I'm going, so you can join me,' " says Islam. "That gave me the courage to do it." Migrating as a group has a lot of benefits, notes Mobarak. The men can live together and share contacts to potential employers. And if someone in the group can't find a job, he can contribute in another way — say cooking the group's meals — and the others will share their earnings with him. Perhaps the most gratifying result of his experiments, says Mobarak, is a finding that came "as a real surprise for me." "Three years later, we go back and survey the exact same households, and what you observe is that the migration rate remains significantly higher in the subsequent seasons," he says. In other words, people continue to leave for the city each monga season even without the low-interest loans. Islam says he'll definitely do so next year, even if it means taking out a high- interest loan from a moneylender: "Now I know the place. I know that I'll be able to get a job." And he says he also knows that even with the high interest rate, the math will work out. It's not that he earned more in the city than he does in the best of times in the country — he made just under $5 a day pulling a rickshaw. But it was certainly more than he would have earned if he had stayed in his village during monga — and it would be enough to pay back the moneylender and still keep his family eating well. Several funders have been so impressed with Mobarak's work that they've partnered with him to scale up his idea into what is now a full-fledged charity called No Lean Season. Today it's helping 160,000 people a year. One of those partners is Evidence Action, a D.C.-based organization formed a few years ago to address a problem of anti-poverty research: Too often, studies uncover promising strategies, but there is no mechanism to translate the findings into an on-the-ground program. Mobarak's results were exactly the kind of idea Evidence Action was looking for, says Karen Levy, a senior official. "The results were pretty astounding. ... To find this very small, very well-targeted intervention that seems to have these big outsized effects ... those things don't come along very often." Another major champion is GiveWell, a group that combs through the research to come up with a shortlist of recommended charities that deliver the biggest bang for your buck. This fall, GiveWell included No Lean Season on the list. Mobarak's work has also contributed to what has been something of a mind shift among poverty researchers, says Michael Clemons with the Center for Global Development, a Washington D.C.-think tank. "Very recently, economists have been looking at a different kind of policy that helps people move to where opportunity is." Clemens and others have been rigorously studying a host of programs and circumstances that have allowed poor people to migrate — sometimes temporarily, sometimes permanently; sometimes within their country, sometimes overseas. Invariably, says Clemens, the conclusion is the same: "If you want to help somebody in poverty, by far the most effective thing you can do is to assist them in moving." Yet apart from No Lean Season and a few other charitable efforts, governments and aid groups aren't exactly rushing to embrace this strategy. Mariful Islam's experience offers some insight into why. Notwithstanding the success of his trip to the city this fall, it was tough. He stayed in a room with 15 other men in a trash-strewn neighborhood. "The place was filthy, smelly," he says. Mobarak says that is a scenario a lot of officials raise when he tries to sell them on bringing migrants to their cities. "The reaction I often get is that 'Oh actually we've been trying to do the opposite. We don't like all these migrants coming in and dirtying up our city and making it more difficult for us to provide adequate services. The cities are already overcrowded. These people might actually be better off in the rural area.' "
To which Mobarak replies: Not if they're going to starve there. Here's something we are learning about how to help the world's poorest people. Instead of trying to create jobs where those people live, a growing body of research suggests that helping them leave can be a lot more effective. NPR's Nurith Aizenman has the story beginning with a farmhand in Bangladesh. NURITH AIZENMAN, BYLINE: Mariful Islam has lived in a rural village his whole life. MARIFUL ISLAM: (Through interpreter) I plant, and I harvest rice in the rice paddies. AIZENMAN: But there's this two-to-three-month period when the rice is just growing, which means there's no work for Islam to do, which means he and his wife and his 1-and-a-half-year-old son have to get by on his meager savings. ISLAM: (Through interpreter) We have a lot of problems getting enough food. AIZENMAN: Instead of three meals a day, they cut back to two, skipping lunch. And it's mostly just rice. This seasonal famine period is so widespread across Bangladesh, it's got a name. Mushfiq Mobarak is an economist at Yale University. MUSHFIQ MOBARAK: So it's called monga. AIZENMAN: Monga. As a kid, Mobarak heard that word a lot because he grew up in Bangladesh where, he says, every year, the newspapers would be filled with reports about the latest multimillion-dollar aid program to get people through the monga season. MOBARAK: So for example, the government had been running food-for-work programs in rural areas, trying to create employment. AIZENMAN: But Mobarak was struck by a major flaw in this approach. There's just a limit to how many jobs you can create in a place like rural Bangladesh. But there's no shortage of jobs in Bangladesh's cities. That gave Mobarak an idea. MOBARAK: Why don't we try to move people to where the jobs are? AIZENMAN: Migration is an age-old response to poverty. But people also often hesitate because it can be risky. So Mobarak set up what's been a years-long series of experiments to see if a little aid could ease the way. During the monga season, he gives farm workers a one-time, very low-interest loan they can use to get themselves to the city - less than $20. MOBARAK: That pays for the round-trip bus fare to the city, plus a few days of food. AIZENMAN: The result - the workers who have gotten the help have been about 60 percent more likely to try their luck in a city. Most of them have succeeded in getting a job, mainly pulling rickshaws. And with the extra money, their families have consumed an average of at least 36 percent more food. That's a much better track record than the traditional food-for-work or food-for-distribution programs. MOBARAK: About five times as cost effective. AIZENMAN: So impressive, it prompted several funders to partner with Mobarak to scale up his idea into a charity - it's called No Lean Season - that today is helping about 160,000 people a year. Mobarak's work has also contributed to what's been something of a mind shift among poverty researchers. Michael Clemens is with the Center for Global Development, a Washington, D.C., think tank. MICHAEL CLEMENS: Very recently, economists have been looking at a different kind of policy that helps people move to where opportunity is. CLEMENS: If you want to help somebody who is in poverty, by far, the most effective thing you can do to assist them is to assist them in moving. AIZENMAN: And yet, governments and aid groups aren't exactly rushing to embrace this strategy because, well, it's fraught. Take the case of Mariful Islam, the farmhand in Bangladesh. Last month, he used a loan from No Lean Season to make his first trip ever to the city, and it was tough. ISLAM: (Through interpreter) I stayed in a room with 15 other men. The place was filthy and smelly. AIZENMAN: Mushfiq Mobarak says that's a scenario a lot of officials raise when he tries to sell them on bringing migrants to their cities. MOBARAK: The reaction I often get is that, oh, actually, we've been trying to do the opposite. We don't like all these migrants coming in and dirtying up our city. And these people might actually be better off in the rural area. AIZENMAN: To which he replies - not if they're going to starve there. Mariful Islam would agree. As unpleasant as his time in the city was, he says, next year, I'm definitely going back. (SOUNDBITE OF SIGNAL HILL'S "A SECRET SOCIETY") Transcript provided by NPR, Copyright NPR.